Curried sweet potato soup with coconut milk is a welcome dish during the cooler months. 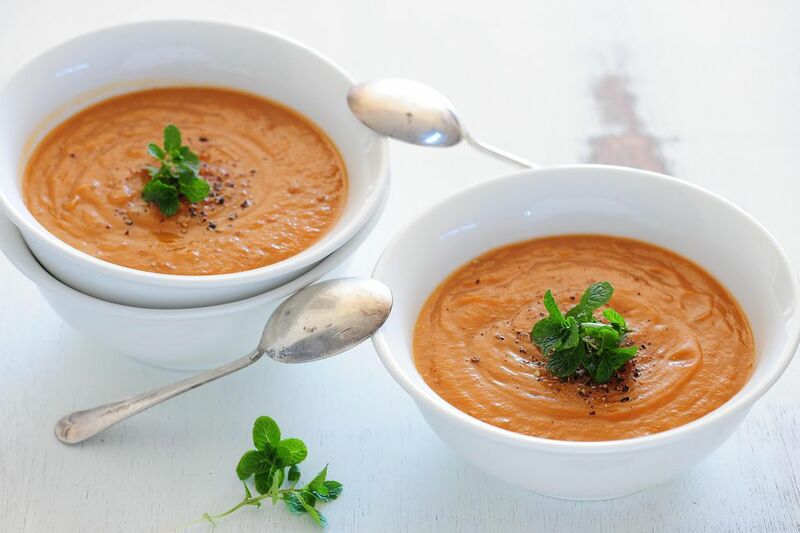 The creamy, aromatic soup has a subtle sweetness from the roasted sweet potatoes since roasting enhances their caramel flavor. The spices used in this recipe are curry powder and garam masala, a blend of warm spices commonly used in Indian cuisine. The coconut milk adds a nice creamy texture to the soup. Slice the sweet potatoes into 2-inch rounds. Place potatoes on a baking sheet and drizzle with 2 tablespoons of the olive oil. Season with salt. Bake for 1 hour, or until tender. Remove from the oven and set aside to cool. Meanwhile, in a large saucepan, heat the remaining 2 tablespoons olive oil over medium heat. Add the onion and celery and fry, stirring often, for 5 minutes. Add the garlic and fry for 30 seconds. Add garam masala and curry powder. Fry, stirring constantly with a wooden spoon, for 30 seconds. Remove the saucepan from the heat. Scoop flesh out of the sweet potatoes and discard the skins. Place potatoes into the saucepan and stir well to coat in the spices. Add stock and bring to the boil. Turn the heat down to medium-low and cover. Simmer soup for 15 minutes. Remove soup from heat and cool. Ladle soup into a blender or food processor and blend in batches until smooth and creamy. Place soup back into the saucepan over medium heat. Add coconut milk and water and stir well to combine. Simmer soup over medium heat for 5 minutes. Divide soup into bowls and serve with a slice of crusty bread for dipping if desired. This recipe features ingredients—garam masala and coconut milk—that are common in Indian and Southeast Asian cuisine. Garam masala, which means "hot spices," is a blend of ground spices like cumin, coriander, cardamom, and cloves. It can also include saffron, ginger, garlic, turmeric, fennel seeds, and fenugreek, as well as other spices. You can find it in the spice aisle or make your own. Coconut milk is used in several Thai recipes to add creaminess and is often paired with spicy ingredients to bring a cooling touch to the dish. Make sure to use coconut milk and not coconut cream, as the coconut cream is much thicker than the milk. Cream of coconut is a sweetened product, so that should not be substituted.